Xiaomi Redmi Note 6 Pro is expected to be the Chinese phone maker's next offering in its affordable Redmi smartphone series. We have heard a lot of chatter around the smartphone in the rumour mill in the past, but now have a closer look at its details thanks to alleged live images of the smartphone and its retail box. The Redmi Note 6 Pro is expected to sport a 6.26-inch Full Screen display with a 19:9 aspect ratio and possible 1080x2280 pixels resolution, which could mean that the Redmi Note 5 Pro could end up sporting a display notch. Other specifications listed on the smartphone's protective film, as spotted on Reddit, reveal a dual selfie camera setup with a 20-megapixel primary and a 2-megapixel secondary sensor. At the back, the Redmi Note 6 Pro will allegedly sport a 12-megapixel primary camera sensor and a 5-megapixel secondary unit. The handset is expected to get a 4,000mAh battery under the hood, with support for some sort of fast charging - our bet would be on Quick Charge 4.0. Additionally, we could expect USB Type-C on the smartphone, but Xiaomi might just stick with Micro-USB as it has with all of its recent Redmi-branded handsets. 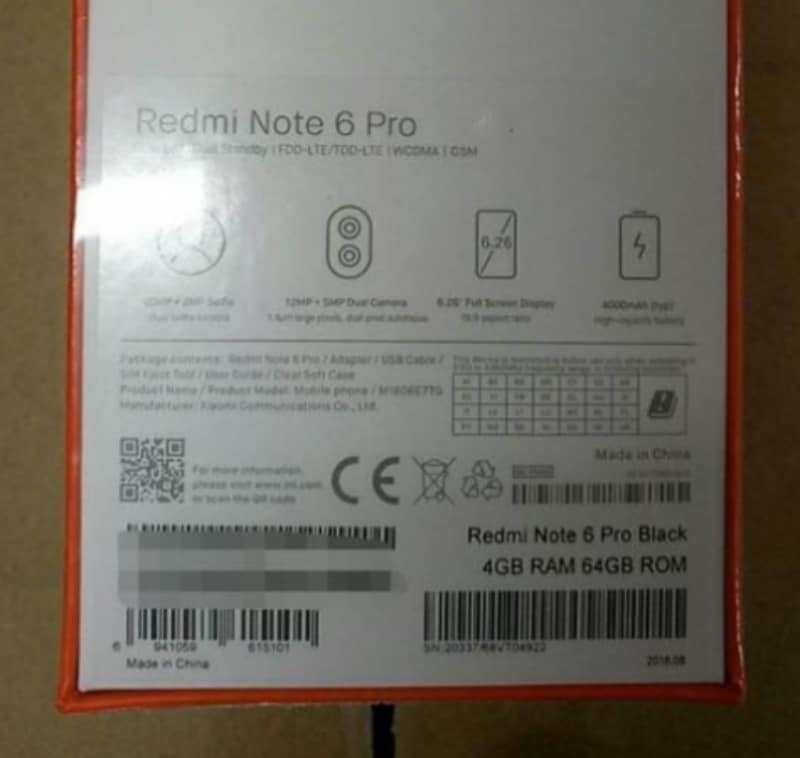 Yet another leak, this time courtesy GlobeMobiles, gives us a look at what is supposed to be the back of a retail box of the Xiaomi Redmi Note 6 Pro. The box lists the above-mentioned specifications along with mentioning that the phone will be made available in a Black colour option and 4GB RAM/ 64GB storage configuration. A report from last month however claims that there will also be an entry-level 3GB RAM/ 32GB storage option for users to choose from. The same report from last month had alleged that the Redmi Note 6 Pro would be priced anywhere between EUR 200 and EUR 250 (Rs. 16,900 to Rs. 21,100) for European markets, and be launched with a cheaper price tag in other markets like India where the predecessor Redmi Note 5 Pro has a starting price tag of just Rs. 14,999. The Redmi Note 6 Pro could get a premium 6GB RAM variant in India and China, and be sold in Black, Blue, and Gold colour variants.